Why do most children get stressed before going to a language camp? When we imagine a children’s camp, in our mind we see a picture of carefree games among green scenery. Yes, this is in fact the case, but often the period preceding the departure of the child to an English language camp is accompanied by stress and anxiety, and lack of self-confidence. The stress and anxiety of children who are about to go to a summer language camp, is something completely normal and usual for most of the children. They find themselves in a new environment, away from home, and they meet many new people, which causes anxiety and high levels of stress in them. For most people, the fear of the unknown is something normal, but for the kids this fear is stronger and they need our support, and help by the teachers in the camp. The very fact that they will go to a new place, away from their parents or the care of the nanny, creates tension and worry for the child. The kid feels insecure and needs help. The more prepared a child is before the language camp, the better, as this will guarantee the kid a pleasant experience and positive emotions until the end of his stay. The parents have to prepare their child in advance for what to expect in the camp, but the managers of the language camps also have various methods to deal with the anxiety of the children in the language camp. However, there are easy ways used by the managers to deal with this problem and to prepare mentally the kids for the adventures in the camp. One of the advantages of summer language camps is that the team of teachers and animators work individually with each child. Paying individual attention is the key method that is required to solve the problem with the primary stress response, when entering the language camp. They pay personal attention to kids with specific needs. Teachers listen carefully the problems of children and they look for effective solutions in order to deal with the anxiety of the particular child. Since each child is a separate individual with his own needs, the team of the camp never applies the same method to other kids. Having nightmares and fear of the dark, and loneliness at night, during sleeping in the language camp, are common for most children. That is why the managers of children’s language camps recommend parents to put a favorite toy or item in the luggage of the kids, because it will remind them of home. Thus, they will easily get used to the conditions of the new environment out of home. Another advice they give to parents is, few weeks before the camp, to send the child to stay at friend’s house or in the house of relatives, in order the kid to get used to sleeping in a new environment faster and easier. During the camp, teachers and animators are constantly monitoring the safety of all children, and they pay special attention to those kids who have troubles sleeping and problems with adaptation. Usually, by the second or third day most children get used to the new conditions and feel more comfortable. Besides working individually with children who have serious difficulties in the English language learning, the qualified teachers and animators in the camp communicate constantly with the children, as they help the children when they identify that a kid has problems with the adaptation in the camp. They explain to the child that his feelings are normal and this will pass. Kids in the camp sometimes meet many new people within a day, and this can be very stressful especially for the shy kids. As we have already mentioned, all children are different and the stress is expressed differently in them. Some children appear to feel calm, but they actually experience a lot of anxiety that they hide. These children have problem with expressing their feelings and emotions. In contrast, other children openly show their fear by crying or trembling. The children’s language camps have the practice to assign a supervisor for each child who has to provide the necessary support to the kid when he notices signs of intense fear and anxiety in the child. Usually, most children need 1-2 days to deal with the stress, caused by the life in a new environment, away from home. Kids even have a better ability to adapt in a new environment compared to adults. There is rarely a situation when a child can’t adapt at all to the environment of the language camp. But if this happens, the team of the language camp has two options. The first option is the child to leave the camp and go back home, the second option – a close relative of the kid to arrive at the camp and help him to adapt to the environment. What is the result after the camp? No matter how stressed a child is before going to a language camp, at the end of it the kid feels more confident and calmer after receiving the respective support and help by the teachers and animators. Undoubtedly, the language camps for children provide a valuable life lesson to each child and help them learn useful skills for social communication. What can we do with parents? 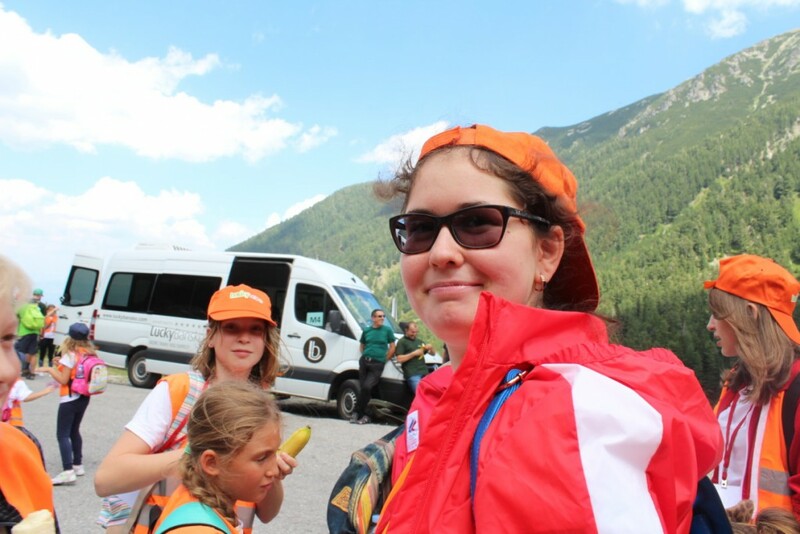 The managers of the children’s language camp recommend parents to work with their children before sending them to the language camp, in order to prepare the kids mentally for this experience. One of the methods to deal with stress in children going to a language camp, is to prepare them in advance for the activities they are going to perform in the camp, and for the requirements of the new life in the camp. Communication between the parent and children is very important before going to the language camp, and it is an integral part of the preparation for the departure to a language camp. This preparation is not only limited to choosing things to put in the luggage. A few weeks before going to the language camp, inform your child about all activities that are offered in the camp. Be positive when you talk to your child and encourage him mentally, tell the kid that he can overcome all challenges. Usually, the child‘s imagination has the ability to create fearful pictures when expecting to experience something new and unexpected. It is a good idea to talk with the kid privately and ask him which is his biggest fear. Explain to the kid that there is nothing to be afraid of. You can remind your child of how he successfully overcome previous stressful situations. This will encourage the kid further and will make him more confident. It is recommended not to spend a lot time saying goodbye to the child before leaving to the camp, and not to prolong it because this can cause more anxiety. For this reason, it is important the parent to look calm and confident in order to convince the child that going to a language camp is not that scary. The anxiety of the parent can easily be transferred to the kid, so protect your children by keeping calm, regardless of the fact that you also feel worried. The faster the child overcomes his fear, the better stay he will have in the camp. Therefore, you have to speak with your kid about this and explain that there won’t be present parents, so the children make their own decisions. Reply to all questions that interest the kid. One of the advantages of the language camp is that it encourages the children to be independent and to make their own decisions, without influence by teachers and parents. One of the methods to deal with the anxiety of your child is to send him to spend the night at friend’s house or at the house of a relative before going to the language camp, so that the kid doesn’t feel so stressed when he has to sleep in the language camp. It is normal for every kid to feel home nostalgia in the first days. So if he has a favorite toy with him, reminding him of home, this will help to overcome the unpleasant feeling. We all know that deep abdominal breathing brings positive energy and calms down. When we breathe deeply, we can analyze our thoughts and feelings, and “scan” our body. The deep breathing techniques would be very beneficial for a highly stressed child. When a child learns to breathe deeply, it will be easier to deal with difficult emotional situations and moments of stress. If our child experiences high levels of anxiety with regard to the departure to the language camp, we can show him some breathing techniques that the kid can use in the moments of high anxiety in the language camp. Yoga exercises have relaxing effect on both adults and children. So it won’t be a bad idea if you take your kid at your next yoga lesson. In some children’s language camps there is a yoga class included in the activities, so this is an excellent opportunity for your kid to participate in the yoga classes, because this will help him overcome the stress more easily. If our child is stubborn and still has a strong feeling of fear caused by the expected departure to the camp, it is good to consult with an experienced child psychotherapist. He can give us useful advice on how to reduce the stress in our child. The consultation with a psychologist about the departure of our kid to a camp, doesn’t mean at all that the child has mental problems.